I'm a relatively fussy eater. Always have been and always will be. Up until 6 months ago, I had led a relatively sheltered life, gastronomically. All sorts of things disagreed with me. There was a time not so long ago when tomatoes, avocados, prawns and any form of fish was a total no go area. Luckily times have moved on since then, but only very slowly. Encountered in the goodie bag that Catty gave me. Essentially, its filled liquorice. Filled with what I hear you say? I'm not too sure, I can't read Finnish but my guess is a sort of chocolatey/malty combination. And lovely it was too. I dislike liquorice, but this worked. Nice and definitely have again. I never order steak tartare. The thought sickens me, to be honest. And the fact that you mix in a raw egg yolk with it too. No thank you. 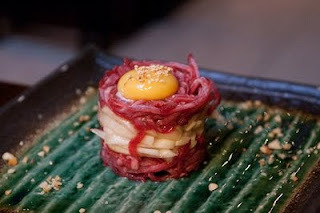 What you can see above is essentially a korean version of a steak tartare. Called yook hwei, it is seasoned raw beef with sliced pears. For me, it was an interesting and challenging combination but I gave it a go. The beef was chilled and icy, and doused in a sesame dressing. The sesame overpowered the flavour of the beef but combined with the sweet pears, it was a real fandango of textures and flavours. All right, but wouldn't eat a whole one. Hmm, tongue. Another new introduction for me at the Korean BBQ at Koba. A slightly tougher and stringier meat in my eyes, it definitely has quite a unique taste, which is far from unpleasant. I would say it definitely has a deeper, meatier, more developed flavour than your regular cut of beef. Would I have it again? Definitely, although I wouldn't say it would be the first thing I would choose. Smoked salmon. Yeeurgh! Slimy, fishy and frankly disgusting. These have been my thoughts on the issue for pretty much every single one of my years on this planet. It was going to take something special to change my mind. And then it happened. Covent Garden has been holding a "Real" food fair every Thursday from April, where a decent amount of stalls are set up and selling food of all sorts of shapes and sizes. 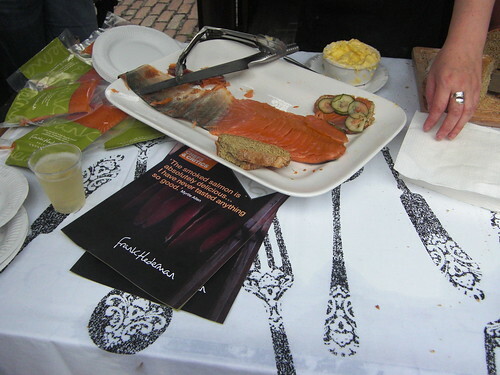 This particular Thursday saw Niamh (aka @eatlikeagirl) set up stall and sell some smoked salmon sourced from Frank Hederman back in her homeland of Ireland, accompanied with home baked soda bread, pickled cucumbers and Irish butter. I never thought it would happen, but this smoked salmon really opened my eyes. It was incredibly meaty and didn't have that fishy smell I normally associate with smoked salmon. The flavour had subtle hints of smokiness, as you would suspect, but nothing overpowering. It was smooth as opposed to slimy and the bread and pickles were the perfect accompaniment. A total triumph. For more info, please read Niamh's post right here. 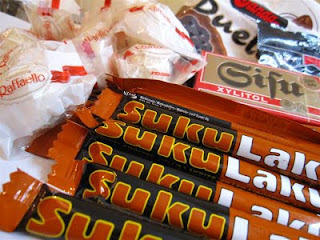 Hurrah for new tastes! They say your tastebuds change every 7 years so it's worth re-trying things you thought you previously didn't like just in case. I never liked parsley when I was younger and now I'm never without it. we'll have you on pigs' trotters next... well done for having a go with the new stuff - fortune favours the brave! I have to admit, I'm not a big fan of eating tongue, but I have eaten it, just need to not think about it too much (tongue, on my tongue...etc). Congrats on broadening your horizons though!